Diesel engines are started by supplying compressed air into the cylinders in the appropriate sequence for the required direction. A supply of compressed air is stored in air reservoirs or 'bottles' ready for immediate use. Up to 12 starts are possible with the stored quantity of compressed air. The starting air system usually has interlocks to prevent starting if everything is not in order. 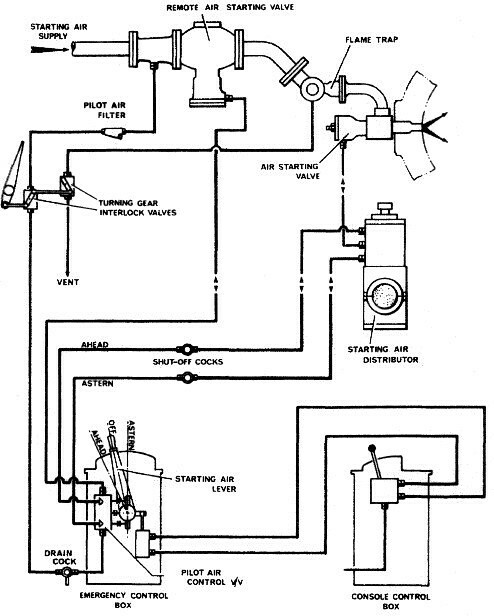 A starting air system is shown in Figure below. Compressed air is supplied by air compressors to the air receivers. The compressed air is then supplied by a large bore pipe to a remote operating non-return or automatic valve and then to the cylinder air start valve. Opening of the cylinder air start valve will admit compressed air into the cylinder. The opening of the cylinder valve and the remote operating valve is controlled by a pilot air system. The pilot air is drawn from the large pipe and passes to a pilot air control valve which is operated by the engine air start lever. When the air start lever is operated, a supply of pilot air enables the remote valve to open. Pilot air for the appropriate direction of operation is also supplied to an air distributor. This device is usually driven by the engine camshaft and supplies pilot air to the control cylinders of the cylinder air start valves. The pilot air is then supplied in the appropriate sequence for the direction of operation required. The cylinder air start valves are held closed by springs when not in use and opened by the pilot air enabling the compressed air direct from the receivers to enter the engine cylinder. An interlock is shown in the remote operating valve line which stops the valve opening when the engine turning gear is engaged. The remote operating valve prevents the return of air which has been further compressed by the engine into the system. Lubricating oil from the compressor will under normal operation pass along the air lines and deposit on them. In the event of a cylinder air starting valve leaking, hot gases would pass into the air pipes and ignite the lubricating oil. If starting air is supplied to the engine this would further feed the fire and could lead to an explosion in the pipelines. In order to prevent such an occurrence, cylinder starting valves should be properly maintained and the pipelines regularly drained. Also oil discharged from compressors should be kept to a minimum, by careful maintenance. In an attempt to reduce the effects of an explosion, flame traps, relief valves and bursting caps or discs are fitted to the pipelines. In addition an isolating non-return valve (the automatic valve) is fitted to the system. The loss of cooling water from an air compressor could lead to an overheated air discharge and possibly an explosion in the pipelines leading to the air reservoir. A high-temperature alarm or a fusible plug which will melt is used to guard against this possibility. Great care is to be exercised in the operation and maintenance of starting air systems. The hazard of compressed air and lubricating oil forming an explosive mixture must be avoided. Oil from any source must be excluded from the starting air system. Air compressor, starting air reservoir blow down drains are to be operated at regular intervals, and if automatic, their function verified. Periodic inspection of air starting system pipelines is to be carried out to ensure that no build up of oil is occurring. Highly flammable cleaning fluids must never be used in any part of the starting air system. Any residue of liquid or vapours could result in an explosion. Routine duties must include the manual checking of the main air starting valve pipes for any increase in temperature, which would indicate leakage of combustion gasses into the system. 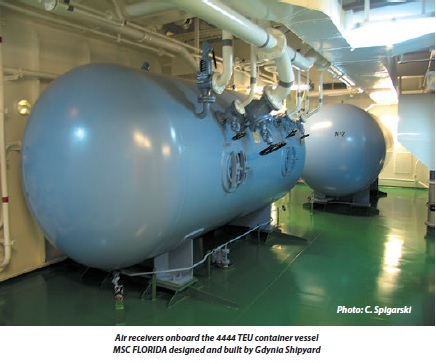 It is particularly relevant during manoeuvring when the main air starting reservoirs are open to the system despite the existence of non-return valves and other devices. It is absolutely essential that if an air starting valve is in any way suspect that immediate action is taken i.e. shutting the fuel off the unit in accordance with the manufacturer's instructions, "gagging" the valve shut, and replacing the valve at the first opportunity. Only in exceptional circumstances and according to the Master's authority is the main engine to be operated with leaking air starting system valves. Air starting systems usually incorporate two or more air reservoirs. According to experience with the main engine plant, the Chief Engineer is to issue standing instructions regarding the air reservoirs which are to be online during manoeuvring. Following manoeuvring and during full away passage conditions and dependent on the particular system i.e. connections with auxiliary engine air starting system etc., as many air reservoirs as possible are to be taken off line and their isolating and stop valves shut. The pressure in these reservoirs is to be maintained at the operating maximum.